Public can see them for the first time at the ANA 2018 Philadelphia World’s Fair of Money®. (July 16, 2018) — The latest recovery of sunken treasure from the legendary “Ship of Gold,” the SS Central America, includes six coins that now comprise the finest known “San Francisco Mint denomination set” for $1, $2.50, $3, $5, $10 and $20 gold pieces, according to the California Gold Marketing Group (CGMG). 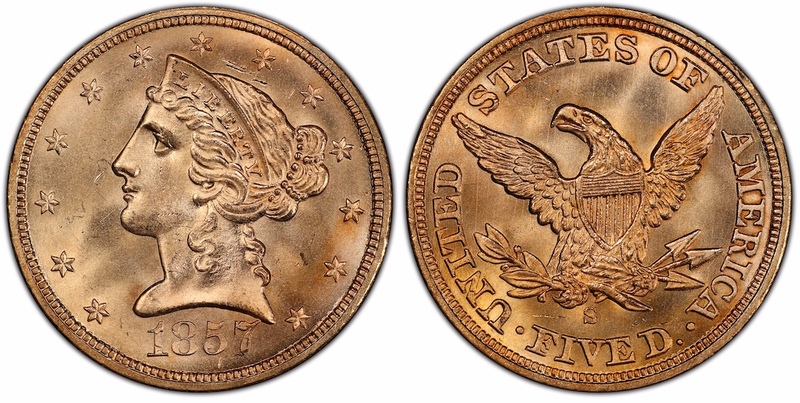 The Double Eagle in the recently assembled set is graded PCGS MS67+, the highest grade ever given to any 1857-S $20 by Professional Coin Grading Service. “It’s the King of Siam set of the SS Central America,” declared CGMG Managing Partner Dwight Manley, referring to the coveted special set of United States coins presented in 1836 to the King of Siam (now Thailand) as a diplomatic gift on behalf of President Andrew Jackson. “Just like they assembled the crème de la crème of coinage from a youthful America for that presentation gift, this stunning San Francisco Mint type set from the California Gold Rush we’ve assembled from the sunken treasure is the greatest set of all the finest known coins. And they all were discovered during the most recent recovery expedition. Some were found securely wrapped inside a ship’s safe,” said Manley. The six coins will be publicly displayed for the first time at booth #225 during the American Numismatic Association 2018 Philadelphia World’s Fair of Money®, August 14-18. A total of 3,134 gold federal, private mint and world coins from the SS Central America were carefully retrieved from various debris fields and miners’ pokes on the Atlantic Ocean seabed during the last recovery expedition in 2014. 1856-S Type II Liberty Head $1, graded PCGS MS65+, the finest known. 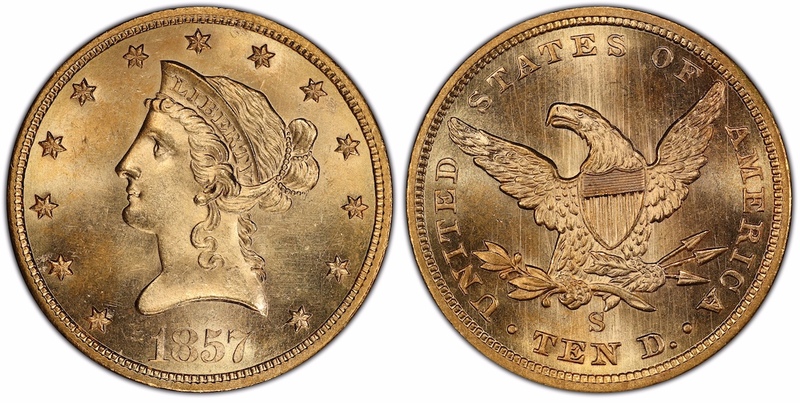 The finest known 1856-S Type II Liberty Head $1, PCGS MS65+, will be part of the San Francisco Mint “gold denomination set” of recovered SS Central America coins on display at the 2018 ANA Philadelphia convention. Photo credit: Professional Coin Grading Service www.PCGS.com. 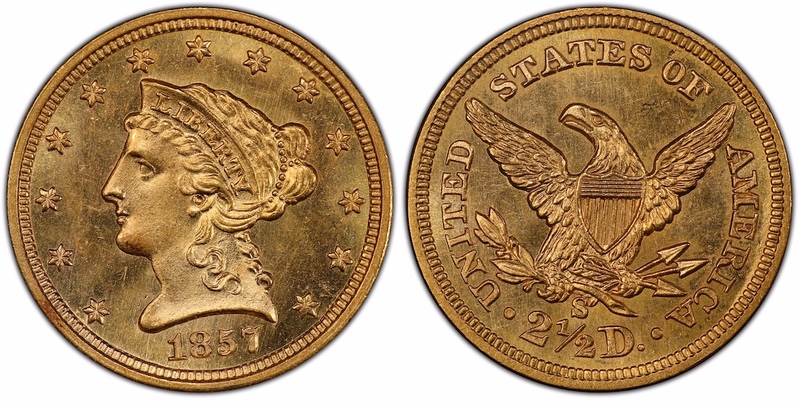 1857-S Liberty Head $2.50, PCGS MS64+, tied for finest known. Tied for finest known, this 1857-S Liberty Head $2.50, PCGS MS64+, will be one of the crème de la crème of recovered San Francisco Mint SS Central America coins exhibited in Philadelphia at the 2018 ANA convention. 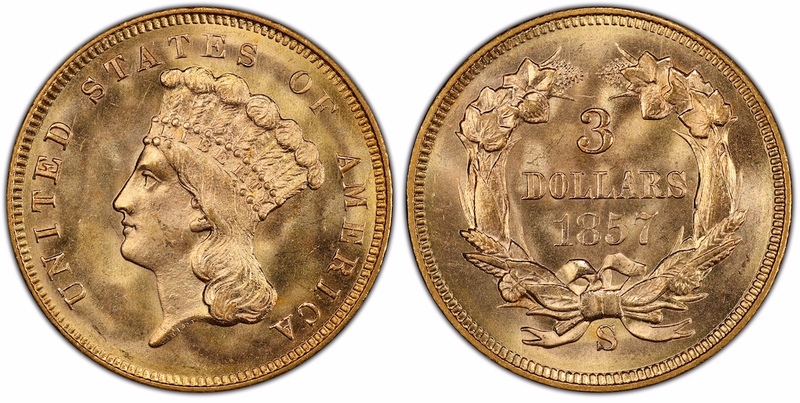 1857-S Indian Princess $3, PCGS MS67, the finest known of all San Francisco Mint $3 gold coins. The finest known of all San Francisco Mint $3 gold coins, this 1857-S Indian Princess, PCGS MS67, can be seen with other recovered SS Central America sunken treasure at the 2018 ANA Philadelphia convention. 1857-S Liberty Head $5, PCGS MS66, finest known. Recovered from the legendary SS Central America, this 1857-S Liberty Head $5, PCGS MS66, is the finest known and will be exhibited with other crème de la crème San Francisco Mint coins at the ANA 2018 Philadelphia World’s Fair of Money®. 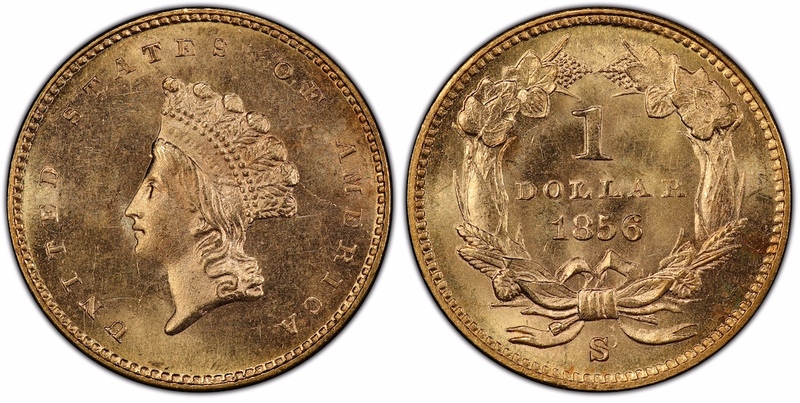 1857-S Liberty Head $10, PCGS MS64+, finest known of all San Francisco Mint No Motto variety Eagles. Retrieved from the fabled “Ship of Gold” sunken treasure and now ready to be exhibited by the California Gold Marketing Group at the 2018 ANA Philadelphia convention, this 1857-S Liberty Head $10, PCGS MS64+ is the finest known of all S Mint No Motto Eagles. 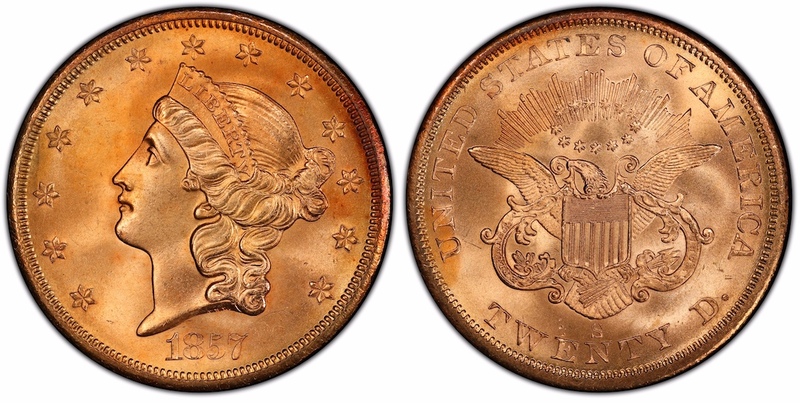 1857-S Liberty Head $20 Spiked Shield variety, PCGS MS67+, with an original, gorgeous red glow luster, and the finest known of any Liberty Head Double Eagle. Exhibiting original, gorgeous red glow luster, the finest known of any Liberty Head Double Eagles, this 1857-S $20 Spiked Shield variety, PCGS MS67+, will be one of the highlights of the SS Central America sunken treasure to be displayed at the 2018 ANA Philadelphia convention. In addition to the San Francisco Mint gold denomination set, CGMG will exhibit other SS Central America treasure, including historic assayers’ ingots as well as California Gold Rush era Fractional and Territorial coins recovered during the 2014 expedition. Bob Evans, the chief scientist on the 1980’s mission that first located and recovered a portion of the fabulous sunken treasure and who assisted with the 2014 recovery, will be at the exhibit each day during the show to meet with visitors. At 11 am on Friday, August 17, he will present a lecture, “The Many (and New) Treasures of the SS Central America: Revelations & Stories from the 2014 Recoveries,” in room 121B of the convention center. “This certainly will be a once-in-a-lifetime opportunity for many people to see an important portion of America’s greatest sunken treasure,” said Manley. The SS Central America was a 280-foot long, three-masted side-wheel steamship carrying tons of California gold that had been shipped from San Francisco to Panama when she sank in a September 1857 hurricane during a voyage from Aspinwall (now Colón), Panama to New York City. The loss of the gold cargo was a major factor in the economically devastating financial panic of 1857 in the United States. 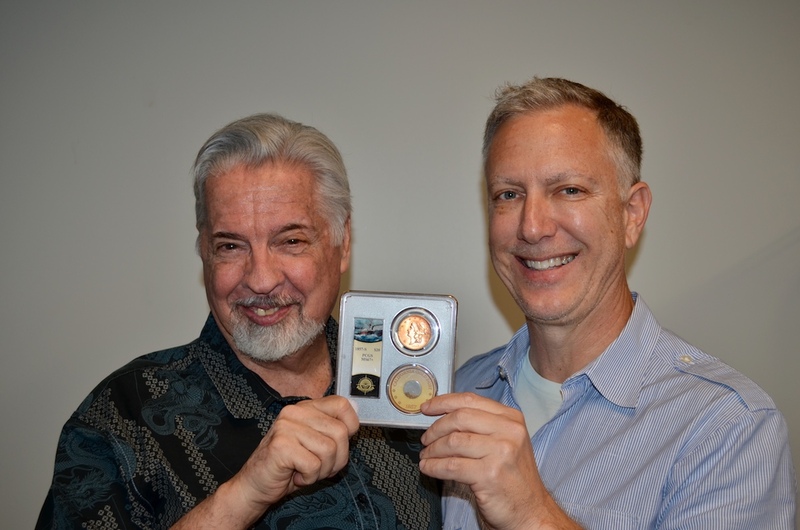 PCGS Co-Founder David Hall and California Gold Marketing Group Managing Partner Dwight Manley hold the finest known Liberty Head Double Eagle, an 1857-S recovered from the SS Central America and now graded PCGS MS67+. It will be publicly displayed for the first time at the 2018 ANA Philadelphia World’s Fair of Money®.